Fifty-five budding poets from more than 20 local Bridgeport and Fairfield primary schools took to the Regina A. Quick Center stage on Tuesday, Jan, 24, to share their poems and personal messages of peace during Fairfield University’s Ninth Annual Poetry for Peace Awards Ceremony. The public event, which was sponsored by the Writing Center, English Department, CT Writing Project, Office of Service Learning and MLK Coordinating Committee, was held in conjunction with the University’s MLK Holiday Observation Week, a weeklong celebration of Dr. Martin Luther King Jr.'s work and legacy. 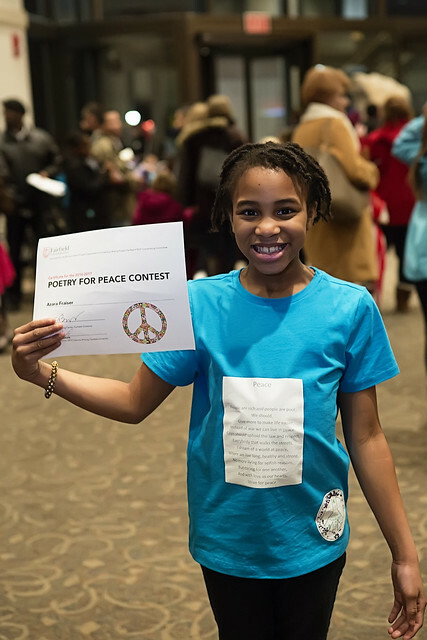 Established in 2008, the "Poetry for Peace" competition invites K-8 grade students from Bridgeport and Fairfield schools to submit original poems written on the theme of peace and what it means to them. Since then over 8,000 poems have been read, and over 500 winners invited to Fairfield to recite their work in front of an audience of their families and peers. Out of the 1,200 submissions received this year, 65 winners were chosen by a panel of judges comprised of University faculty, staff and students, and were selected to have their work published in an annual Poetry for Peace anthology that was distributed to students and parents on the night of the event. The entries were placed into four divisions, which included Kindergarten through second grade, third and fourth grade, fifth and sixth grade and seventh and eighth grade. Below is one of the contest’s winning poems written by St. Ann Academy seventh-grader Alandra Gomez. Peace is light that vanishes the dark. Peace will light us back to harmony. But peace will lead us back. But peace will put us back to our feet by lighting the way to freedom.